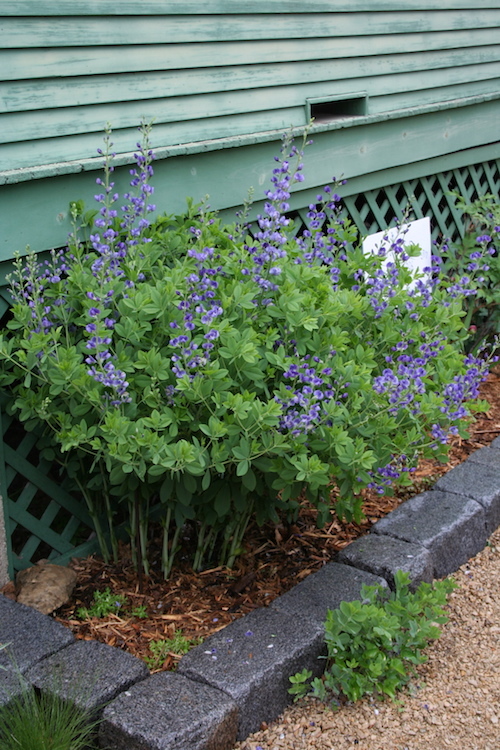 False indigo (Baptisia) is a perennial that looks like a shrub. It’s a great plant for garden borders. Baptisia is a perennial heading up the popularity charts — and having planted several tufts of it in my re-designed front-yard bed, I can see why. Baptisia australis is a North American native (as far north as Iowa) that the Cherokee tribes used for dye and to cure tooth-aches. Its use as a dye is understandable when you see the deep-blue to purple flowers that grow on the plant. Recently, baptisia — more commonly called false indigo — has been the subject of considerable research at the Chicago Botanic Garden, which has introduced two hybrid varieties of baptisia. For their research, the Chicago horticulturists bred Baptisia australis and Baptisia sphaerocarpa to come up with hardy plants with striking flowers. I planted Twilight Prairieblues™, which has a deep purple almost maroon colored flower. (The photo is of mature plant I saw on garden tour recently.) Starlite Prairieblues™ is also hardy and prolific, with plants sending up as many as 100 bloom stalks each season, but its flowers are a lighter blue. Update from 2018: Oh, my goodness, so many more baptisias have been introduced since I first wrote about them in this post from 2009. They are a great plant, and I continue to grow them for their spring blooms, sturdy form, interesting foliage and rattle-like seed heads! Check the November/December 2018 issue of Northern Gardener for an article on the man new baptisia cultivars available. I so love baptisia — and miss it. I don’t have it in my current garden, but I did have it in a house I rented in Pennsylvania at one point. So lovely! Unlike a lot of other tall perennials that need support lest they start flopping over, baptisia has strong “bones.” Structurally, it’s like a small tree. The foliage branches out over leafless stalks. It provides good winter interest, too.